Master Kurt Wong has followed the teachings of Grandmaster Liu Yun Chiao, Master Adam Hsu, and Master Su Yu Chang for many years. He entered Wu Tan in 1972. In 1974 he became a disciple of Master Su Yu Chang. In 1976 he was selected to be a youth goodwill ambassador for the Republic of China. He travelled to North America, representing China with his Kung Fu. In 1978 he moved to North America for further study. He is now a certified public accountant in Alaska. He officially began teaching Kung Fu in Alaska in 1979, and has continued teaching ever since. Master Wong is now the leader of Wu Tan Alaska, Norway, and Australia. HOW DID IT ALL BEGIN AND HOW WAS IT PASSED ON? 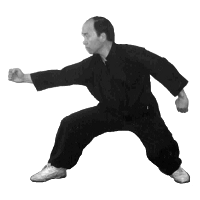 Master Wong began his career in Kung Fu instruction at Tanana Valley Community College in 1979. Alaska Wu Tan was officially founded in 1982 when he received the flag of Wu Tan from Grandmaster Liu Yun Chiao. After his instruction, from 1979 until now, Master Wong has always had belief in the mission to spread the spirit of Wu Tan. He shares this concept with his fellow teachers. Master Wong displays diligence, and follow-through by continuously teaching and at the same time, inviting other instructors to Alaska for study and exchange. 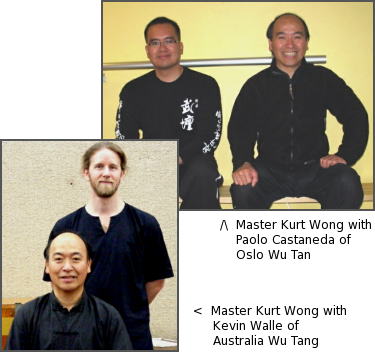 These instructors include: Dr. Liang Zi Tse, Master Adam Hsu, Master Su Yu Chang, Master Jason Tsou, Master Tony Yang, and Master Lu Chang Kuei. These instructors have visited Wu Tan Alaska and offered specific training and workshops. Master Wong hopes to use these exchanges to work together to elevate students interests and the quality of their Kung Fu. This has been his passion from the beginning, for over 30 years. Since the year 2000, Master Wong has begun officially accepting disciples. He currently has over 30 disciples. These disciples include Sifu Paolo Castaneda of Norway, and Sifu Kevin Walle of Australia. Both of these teachers have now also accepted disciples, expanding the traditions and teachings of Wutan, leading to a new “Hwei” generation. Master Wong remembers a saying from Grandmaster Liu. “Practice in Kung Fu can change one’s character.” Especially when following by his side, he personally experienced his greatness and inner virtue. Master Wong would like to share with everyone some words that encouraged him. “A great career is established in the spirit of perseverance and diligence, and great character through daily practice.” He believes that this is the essence of practice, and hopes to propagate this idea as our future direction. 1. Focus on developing good material, and deliver the same in a systematic curriculum to students. 2. Develop quality teachers, elevating their training and quality. 3.Establish respect and trust between student and teacher. He hopes, in the future, to coordinate with Taiwan and other schools for a more fluid communication and a tighter connection, to expand his teaching. He is very positive and optimistic about the entire Wutan Kung Fu Development Center with the election of Master Lin, Zhong His as the chairman. “ I see a bright future”. Master Wong believes it is most important to follow Grandmaster Liu, as a leader in the spirit of Wutan. His essence, virtue, and tradition are the cornerstone of the organization. 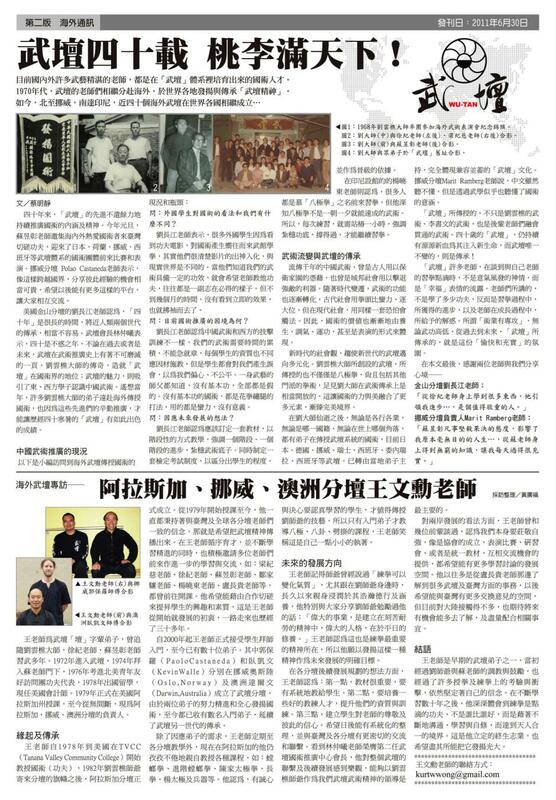 Master Wong has spoken with the elder members of Wutan Kung Fu Development Center regarding the development with mainland China. He believes this should be self strengthened. He hopes to set up an association to organize tournaments and workshops, and offer an exchange program to expand discussion and study. In the past, he received much information from Master Lu regarding affairs with Taiwan. He is looking forward to more communication with Taiwan and opening contact with mainland China, hoping this will further his understanding for future development. Master Wong is one of an early generation of Wutan disciples. He was influenced by Grandmaster Liu and Master Su. Through their teaching and encouragement he overcame many of the tests and challenges of teaching. Yet, he still possessed his own faith in the continuation of his study for the past several decades. He feels deeply that Kung Fu takes a lifetime of practice. One drop of water at a time, requiring years to master. It makes no difference who’s better than who. He has utilized his commitment to study and self development to reach this level of harmony between heaven and man. Master Wong has determined this to be his mission for life, and looks forward to expanding and brightening his future.